What Is an Ankle Sprain? An ankle sprain is an injury to one or more ligaments in the ankle, usually on the outside of the ankle. Ligaments are bands of tissue – like rubber bands – that connect one bone to another and bind the joints together. In the ankle joint, ligaments provide stability by limiting side-to-side movement. Some ankle sprains are much worse than others. The severity of an ankle sprain depends on whether the ligament is stretched, partially torn, or completely torn, as well as on the number of ligaments involved. Ankle sprains are not the same as strains, which affect muscles rather than ligaments. Sprained ankles often result from a fall, a sudden twist, or a blow that forces the ankle joint out of its normal position. Ankle sprains commonly occur while participating in sports, wearing inappropriate shoes, or walking or running on an uneven surface. Sometimes ankle sprains occur because of a person is born with weak ankles. Previous ankle or foot injuries can also weaken the ankle and lead to sprains. These symptoms may vary in intensity, depending on the severity of the sprain. Sometimes pain and swelling are absent in people with previous ankle sprains. Instead, they may simply feel the ankle is wobbly and unsteady when they walk. Even if there is no pain or swelling with a sprained ankle, treatment is crucial. Any ankle sprain – whether it’s your first or your fifth – requires prompt medical attention. An untreated ankle sprain may lead to chronic ankle instability, a condition marked by persistent discomfort and a “giving way” of the ankle. Weakness in the leg may also develop. A more severe ankle injury may have occurred along with the sprain. This might include a serious bone fracture that, if left untreated, could lead to troubling complications. An ankle sprain may be accompanied by a foot injury that causes discomfort but has gone unnoticed thus far. Rehabilitation of a sprained ankle needs to begin right away. If rehabilitation is delayed, the injury may be less likely to heal properly. In evaluating your injury, the foot and ankle surgeon will obtain a thorough history of your symptoms and examine your foot. X-rays or other advanced imaging studies may be ordered to help determine the severity of the injury. Rest. Stay off the injured ankle. Walking may cause further injury. Ice. Apply an ice pack to the injured area, placing a thin towel between the ice and the skin. Use ice for 20 minutes and then wait at least 40 minutes before icing again. Compression. An elastic wrap may be recommended to control swelling. Elevation. The ankle should be raised slightly above the level of your heart to reduce swelling. Early physical therapy. Your doctor will start you on a rehabilitation program as soon as possible to promote healing and increase your range of motion. This includes doing prescribed exercises. Medications. Nonsteroidal anti-inflammatory drugs (NSAIDs), such as ibuprofen, may be recommended to reduce pain and inflammation. In some cases, prescription pain medications are needed to provide adequate relief. In more severe cases, surgery may be required to adequately treat an ankle sprain. 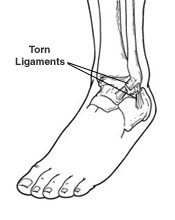 Surgery often involves repairing the damaged ligament or ligaments. The foot and ankle surgeon will select the surgical procedure best suited for your case based on the type and severity of your injury as well as your activity level. After surgery, rehabilitation is extremely important. Completing your rehabilitation program is crucial to a successful outcome. Be sure to continue to see your foot and ankle surgeon during this period to ensure that your ankle heals properly and function is restored.